This Lamborghini Huracan is out to stake a claim as the fastest car around. Its rival, the R35 Nissan GT-R, is lightning fast in the quarter mile but the Huracan’s not playing second fiddle to any car. During a recent time trial at the Texas Motorplex in Dallas, an almost unfathomable two thousand horsepower Lamborghini Huracan went 0-to-60 in 1.8 seconds. After that, it only took the Lamborghini another 2.6-seconds to reach 130mph. In total, it took the 2000-HP Lamborghini Huracan only 7.916-seconds to run the quarter mile at a peak speed of 185 MPH. I’m typing all of this just minutes before I’m about to shut down my computer for the night and hop into my Mazda SUV that’s slower than molasses. Am I dreaming of a former life when I was driving a car that was quick as hell off the line? Not really, no. Because I’ve never even had the slightest inkling of what it feels like to 0-to-130mph in 4.4-seconds. The quickest car I’ve ever had the chance to drive was either a manual 6-speed turbo-charged S6 or a Maserati, but I only got to open up the first off the line. The latter I was parking for my buddy’s dad at the golf course. According to CarBuzz, Dallas Performance is the team behind this modded 2000-HP Lamborghini Huracan. They’ve added 18-inch drag radials which have drastically increased performance. I’m slightly confused because the CarBuzz article linked above states this took place at a drag track in Florida but it very clearly says ‘AAA Texas’ on the walls and that’s definitely the Texas Motorplex in Dallas. Was there another recent event where this modded out 2000-HP Lamborghini Huracan ran and if so, can I see that footage? 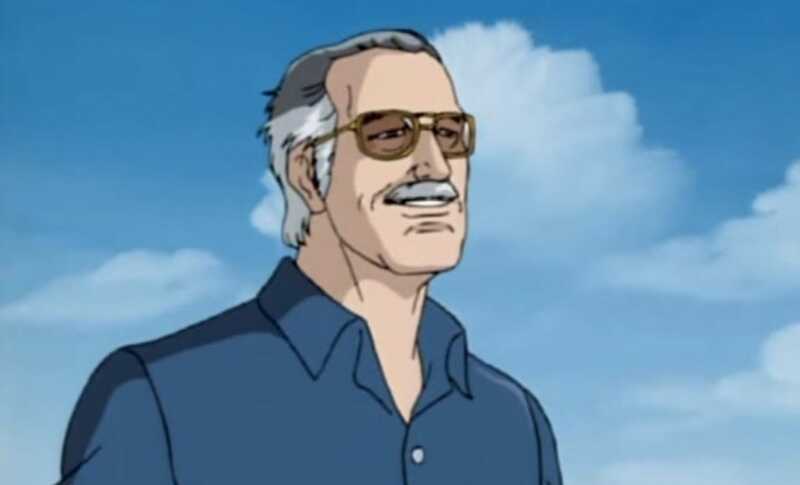 Following the death of Marvel comics’ Stan Lee, people have begun recirculating a 1968 column Lee wrote denouncing racism (something a disturbing number of politicians refuse to do to this day). As part of his storied comics career, Lee spent almost four decades writing regular installments of ”Stan’s Soapbox” on the backs of comics, in which he frequently fought for his heroes’ values of tolerance and equality. Lee himself resurfaced the column in 2017, after white supremacists marched on Charlottesville, resulting in the death of one woman. In a no-longer-available tweet, he shared the image with the words “As true today as it was in 1968. Pax et Justitia -Stan.” 1968, notably, was the year Martin Luther King, Jr. was assassinated, among other events. “Pax et Justitia” is Latin for “peace and justice,” an ideology pervasive in Lee’s comics and in multiple Soapbox columns. Following the Charlottesville tweet, Inverse dug through the archives and found several more examples of Lee fighting prejudice over the decades. He defended Luke Cage’s debut and pointed out the allegories of bigotry in X-Men, all as part of the heroic stories readers were hungry to consume. With the passing of Stan Lee on Monday at the age of 95, we don’t just say goodbye to the face of the Marvel brand, but also the man of 1,000 cameos. The former president and chairman of Marvel Comics is known by many Marvel Cinematic Universe fans as the guy who shows up in the majority of the movies released by Marvel Studios since 2008’s “Iron Man.” But he started doing cameos long before there were superhero movies. Going as far back as the 1960s, Lee’s likeness would be inserted occasionally in covers and inside the pages of the Marvel comics he was overseeing. And from what Lee told Business Insider back in 2015, it was never his intention to pop up in all things Marvel. 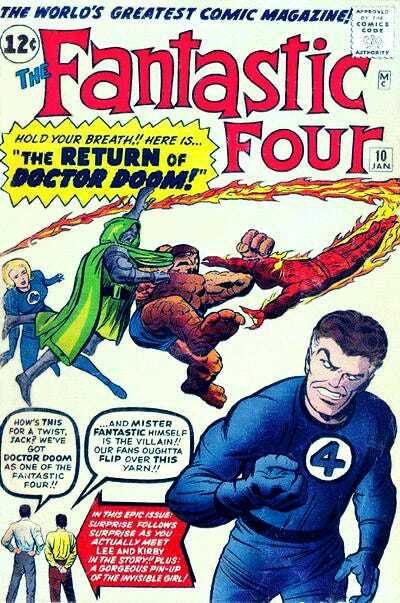 Here’s Lee and fellow iconic Marvel artist Jack Kirby showing up on the cover of a “Fantastic Four” comic in the 1960s. 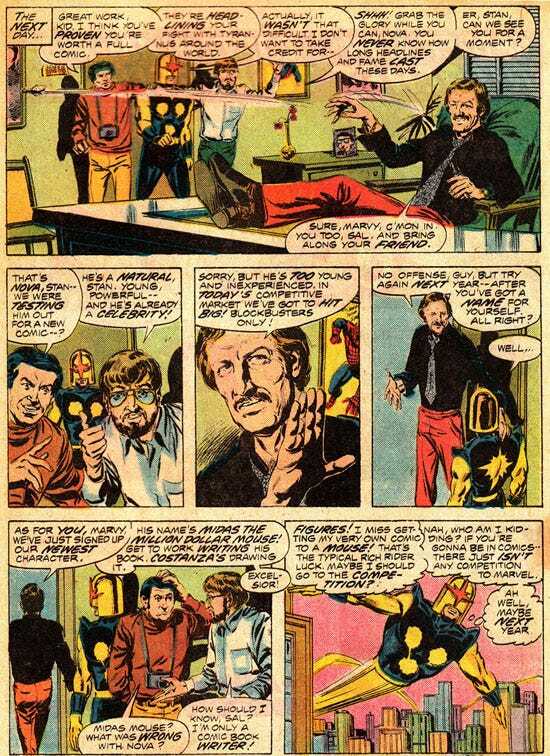 And Lee shows up in this edition of the “Nova” comics in the 1990s. That’s primarily why he also has a fondness for his appearance in 2007’s “Fantastic 4: Rise of the Silver Surfer,” in which he can’t get into the wedding of Reed Richards and Susan Storm because the bouncer doesn’t think he’s really Stan Lee. “I like any of them that seem a little bit funny,” he added. You will next see Lee on the big screen for Sony’s "Spider-Man: Into the Spider-Verse," where he makes a cameo in animation form. The death of Stan Lee, age 95, has been felt by many, but the loss has been particularly profound for the many fans-turned-artists who were inspired by Lee’s legendary career. In the wake of Lee’s passing, as notes of honor and remembrance have flooded social media, stunning portraits of the renowned comic-book writer have stood out. Many of the tributes are accompanied by short anecdotes noting the impact Lee has had on the lives of so many, particularly in the worlds of illustration and animation.